I just hit "reply" to add to this forum....fledging day is in countdown now! Would someone do feeding hotspots this weekend please? I won't be around as much and always miss the goodies coming to the nest. Thanks! Would someone do feeding hotspots this weekend please? I won't be around as much and always miss the goodies coming to the nest. Thanks! Hi Mountain-gal! Every attempt is made to make Hotspots of significant events, like feeding, etc., but the archives have not been great of late - sometimes the action just isn't recorded, so it gets frustrating trying to make a Hotspot. However, if you check out the Observation thread HERE you will see a summary of each day with clickable links to all the significant Hotspots that were made that day. I hope you will allow me to make my first experiment in making a post in the forum. This is my first time in the forum and I have a lot to learn about it. I certainly endorse the message you are sending to all readers. This is short to see if i was successful in posting. Best regards to you and many thanks. Congratulations. It looks as if you have the done a good job of using the "reply" button! Welcome to the forum...it's full of interesting things. Just tuning in, catching up with hotspots from the day. Did Phoe really spend the entire day up on the cam box?? Oh, the things she must have seen!! And wow, she was so graceful both getting up there and then jumping down into the nest. Amazing the change from her attempt just a couple days ago. Eagle Weekly: Say, that was some record! Were you scared being up so high? 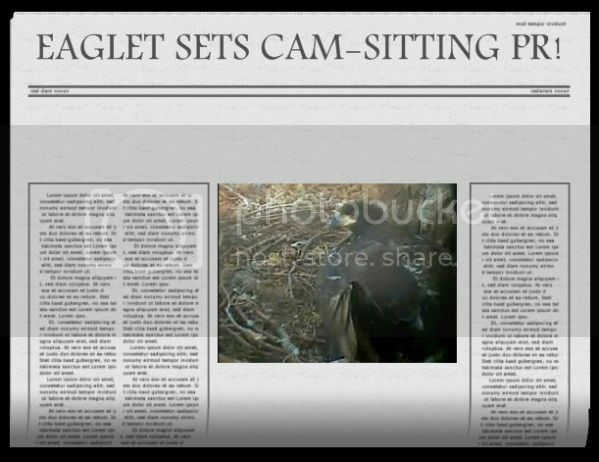 Eagle Weekly: Is it true you went up at 5:37 AM and came down at 7:12 PM? Eagle Weekly: How do you feel after that incredible PR? Eagle Weekly: Folks have been asking, are you a he-eagle or a she-eagle. The public is dying to know! Eagle Weekly: What will you do next? Jump up to the WA cam? The top of the tree? The Sidney nest? What will it be? What about PHoe's food intake? I still can't believe how gracefully she got up and down. I was watching P still snuggled down on the right, but looking around, when she flapped a few times at 5:50 and hopped on the right side of the outer branches of the nest. Then she moved over under the camera range, so the nest looks empty. I think I just heard her make that "gobbling" sound. Maybe breakfast will soon fly in. Beans, you are a very clever lady! Thanks for the laughs this morning! beans, you are SUCH a treasure!